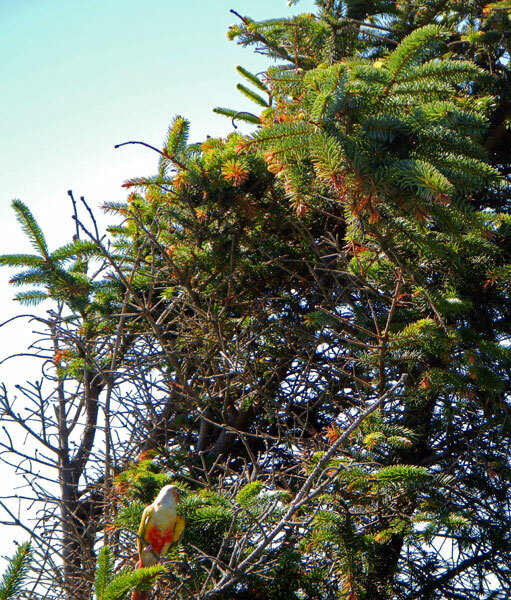 As I wander along the beach a brightly coloured bird flies past me, landing on a nearby bush. Its wings are brilliant yellow and its breast is rosy pink. I have never seen a bird like this before. 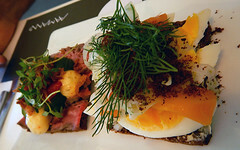 So, some sort of perroquet. 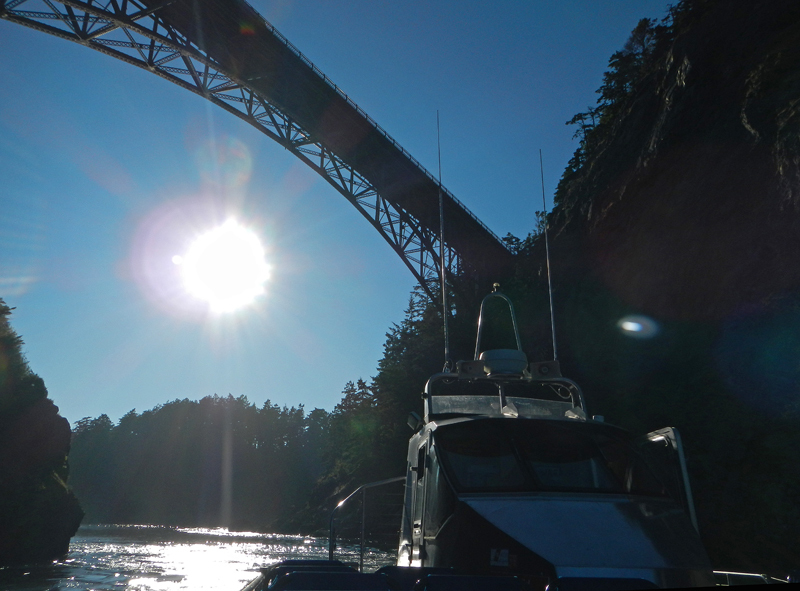 This was in Deception Pass State Park, a State Park that exists on both sides of the bridge linking Fidalgo Island to Whidbey Island. 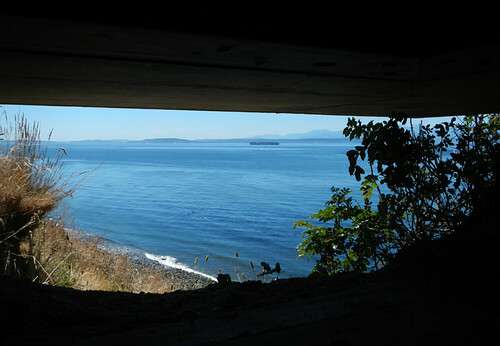 Further down Whidbey Island you run into a series of forts that extend over to Port Townsend on the Olympic Peninsula. Even more forts were put in during the World War II to protect the west coast, and now they are all State Parks with stunning vistas of the waters they were designed to protect. 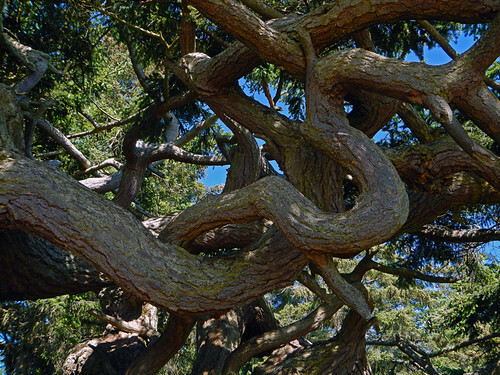 There are also many trails making these State Parks an interesting mix of history and nature. 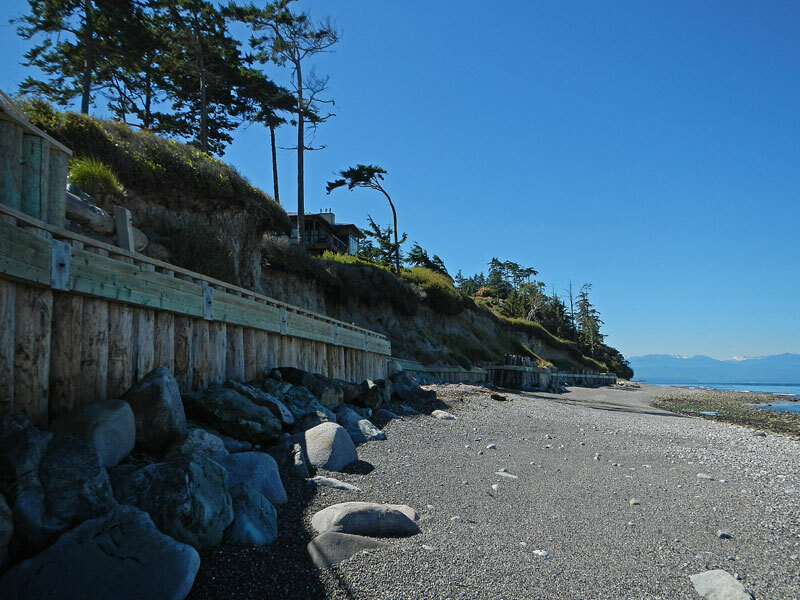 The first beach we came upon was near Fort Ebey State Park. The first stretch of beach was beneath a highly re-enforced embankment. 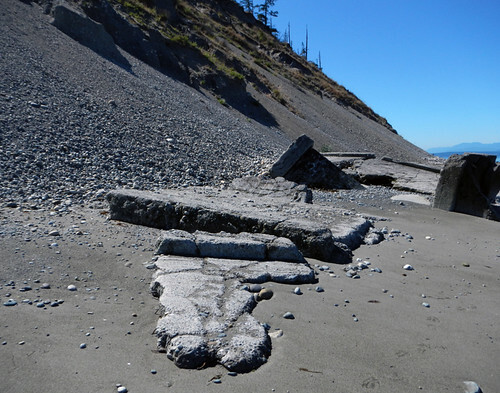 Further down, beneath Fort Ebey, the reinforcements were replaced with rock slides. We discovered the remains of this structure which we think might be the remains of one of the gun turrets fallen down from Fort above us. 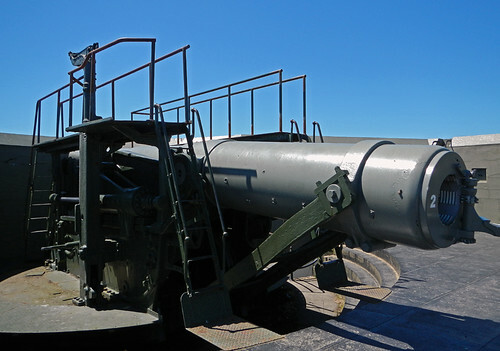 Later, talking to a history buff at the Fort Casey Lighthouse, he commented, “There are supposed to be two gun mounts in Fort Ebey but I’ve only ever seen one.” Anyway, now he knows where the second gun mount went. 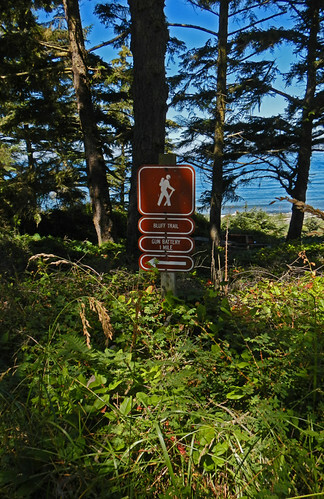 Fort Ebey sign to the Bluff Trail and Gun Battery, a pleasant one mile walk looking down on the ocean. 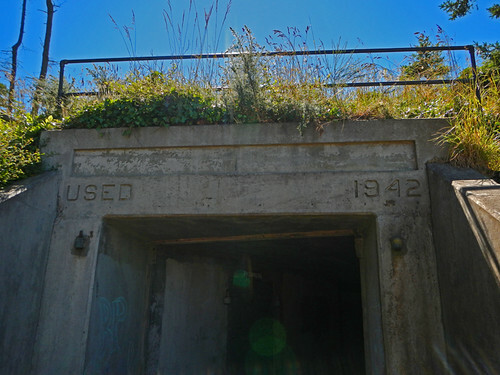 Fort Ebey was one of the Second World War forts built in 1942 by the US Engineering Division. View through the gun sights of the waters they were protecting. Fort Casey is one of the original forts, built in 1902. 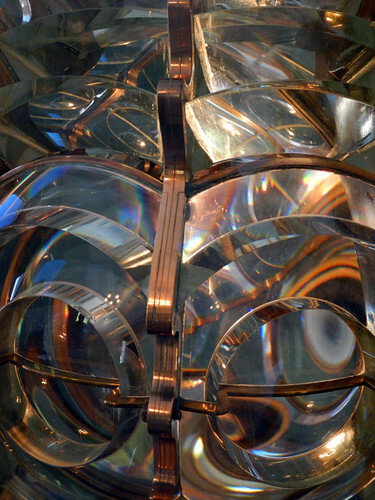 A Spanish Mission-style lighthouse serves as a museum. Apparently every lighthouse along this coast has a different configuration of lights. Before GPS, lost navigators could tell exactly where they were by checking their ‘lighthouse code’ book. Our ‘scenic drive’ down to the Olympic Peninsula started along Chuckanut Drive (as recommended by both Frommers and the AAA). We were supposed to stop at Larrabee Beach. Except there was a parking fee of $10! For half an hour’s stroll on the beach? I think not. Later we discovered that all Washington State Parks require a Discover Pass. The fee (in 2014) is $10/day or $30/year. 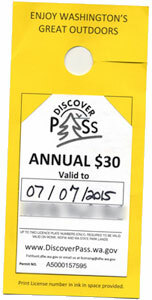 Since our route was littered with State Parks (and we plan to be back) we opted to purchase the one year pass. I’m not sure if the pass is available at every state park – at Larrabee Beach there wasn’t any obvious place to buy one. Once we had the pass in hand I’m not sure how many parks we actually managed to crowd in but it was a lot. Sometimes we got lost and came upon a different park than we were originally planning to go to. It’s all good! I’ve never seen a red dragonfly before, this is surprising! 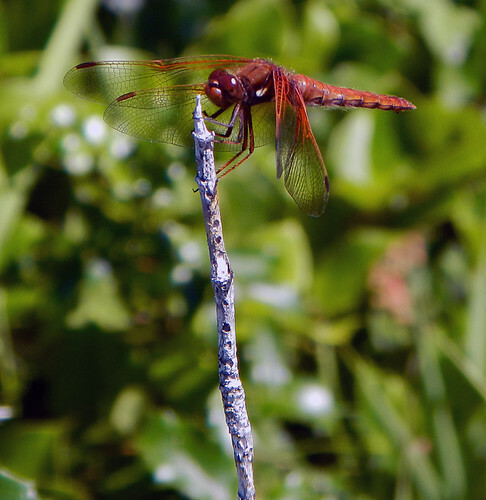 I’ve seen lots of red dragonflies in Asia, but this is the first time I’ve seen one in this part of the world. Ours are usually metallic blues and greens.